This is my least favorite Prairie beer so far and it may have been the style more than the beer itself. I took this out of the beer fridge knowing that it was a dark beer but thinking it was a dark saison not an old ale with a 10% ABV. I really should look at the label before I open beers so I know what I am getting into. Beer pours an almost black color with a thick tan head. Aroma of dark fruit and malt, nothing too exciting. Taste is very similar to the nose with a slight brett funk added to it. 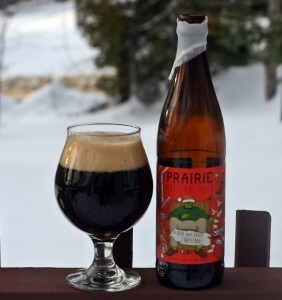 If you want to try some Prairie beer I would recommend you start with their Prairie ale, Merica or Puncheon unless you really like old ales and then you can give this one a shot.